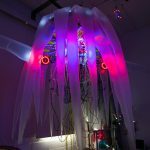 I had seen some photos on Instagram of what seemed like large illuminated jellyfish; once I tracked down Shih Chieh Huang’s “Reusable Universe,” it was one of my favorite pieces of the weekend. 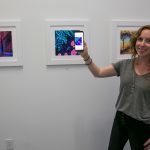 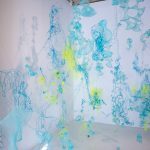 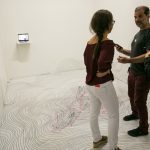 Julie Gratz’s augmented reality prints also blew my mind: If you downloaded a free app and held your phone in front of her beautiful prints, they became a fully animated piece complete with sound. 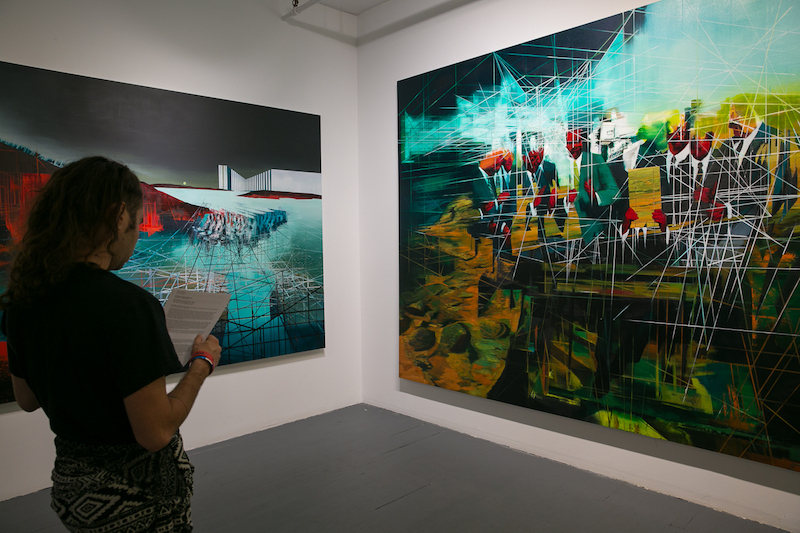 The future of art is here and it’s on our phones as well as on the wall. 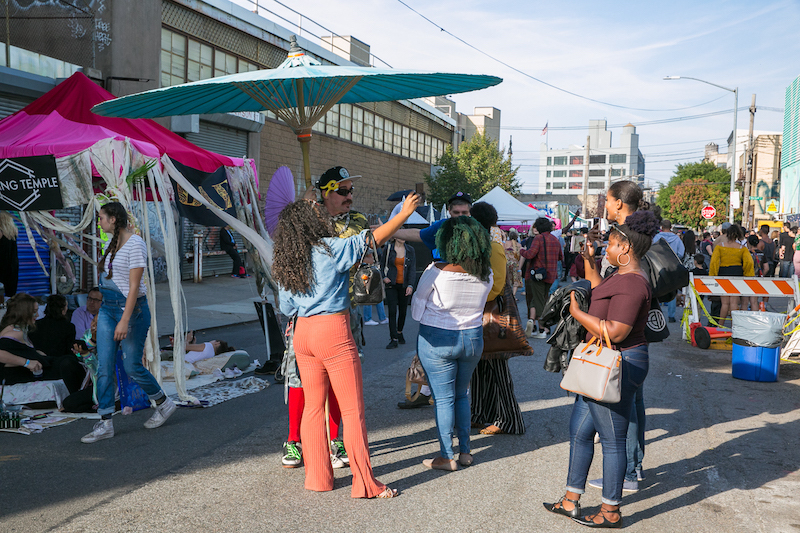 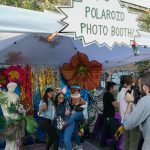 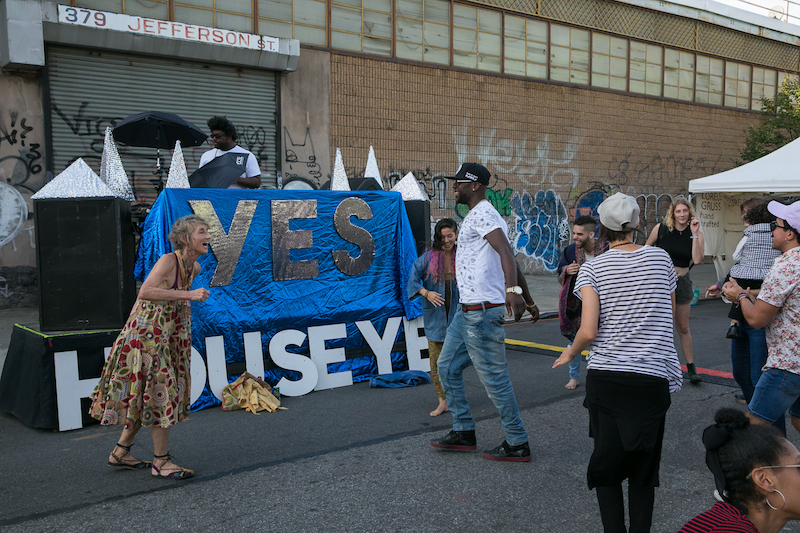 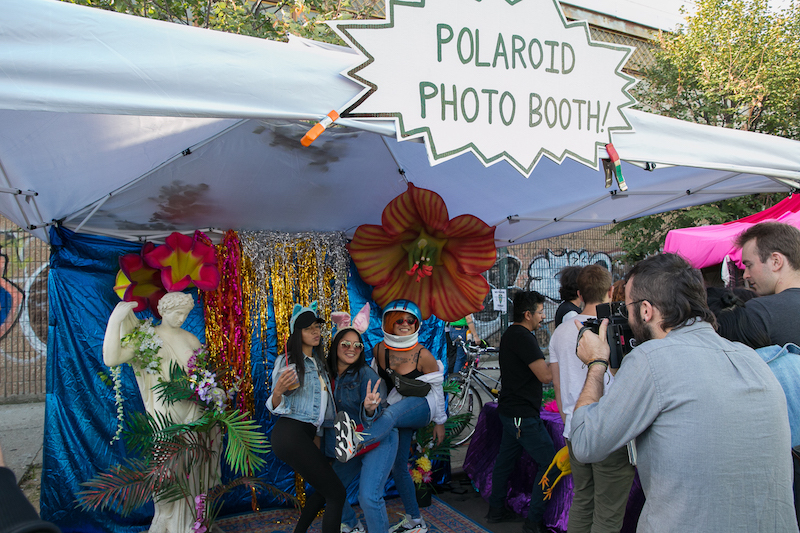 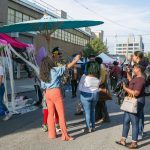 In addition to all the art, House of Yes hosted a block party outside with a Polaroid photo booth, arts and crafts vendors, and more. 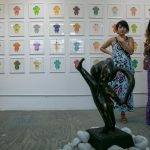 Click through the slideshow to see all the highlights. 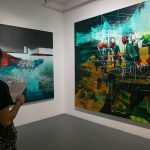 Tim Kent's “Dark Pools and Data Lakes,” large oil paintings of shadowy looking figures and sharp angles. 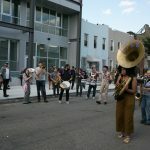 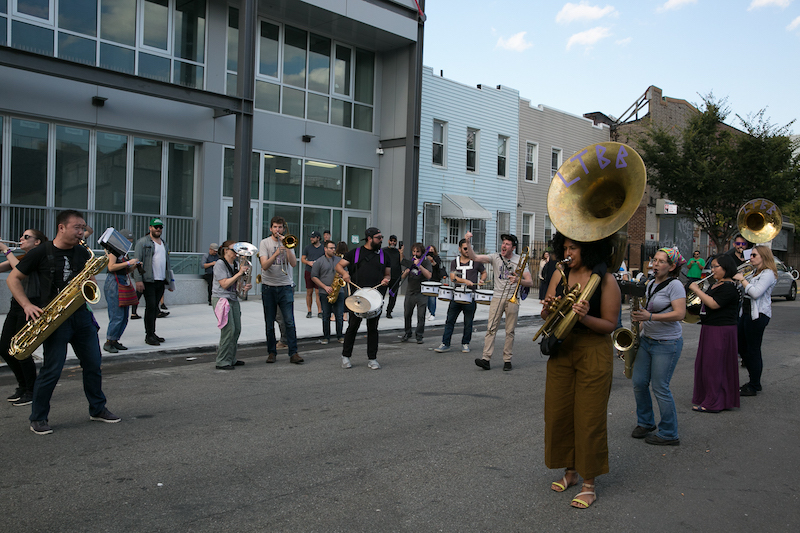 L train brass band parading in front of Pine Box Rock Shop. 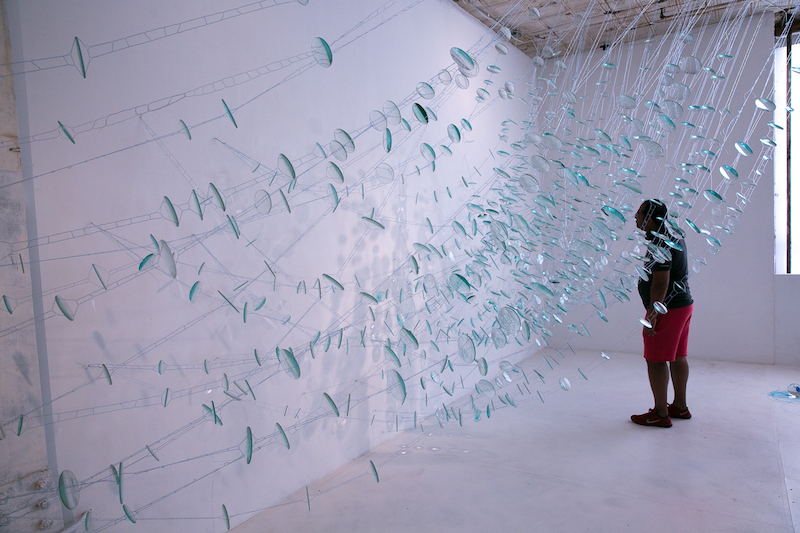 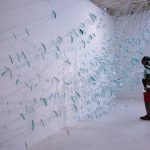 Caroline Cox, “Look Around, ‘Round, ‘Round, ‘Round,” built from microfilament and crystal balls draped from the ceiling across the walls. 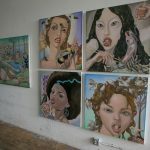 Lena Viddo's large paintings of women and animals in vaguely sexual positions, looking enticing but also absurd. 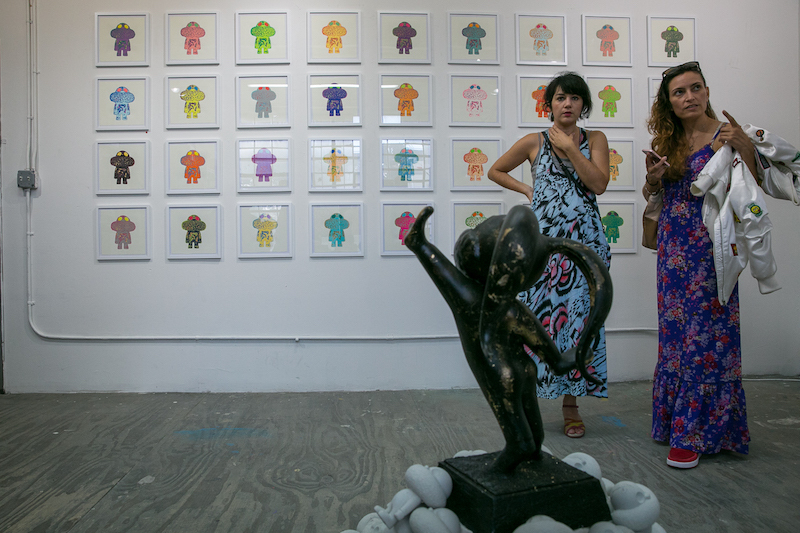 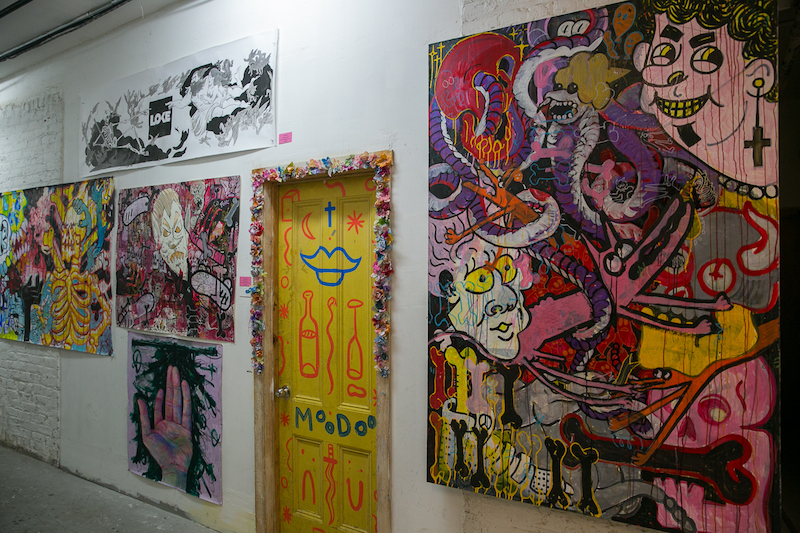 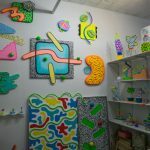 "Wiggle Room," a fun group show with Adam Frezza & Terri Chiao, Chiaozza, Eric Simmons, Ryan Patrick Martin, featured lots of super bright, neon colors reminiscent of early '90s graphics. 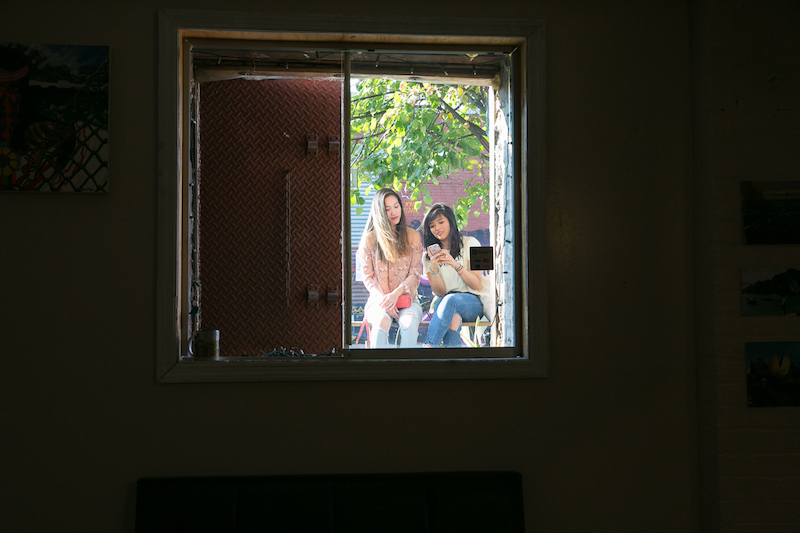 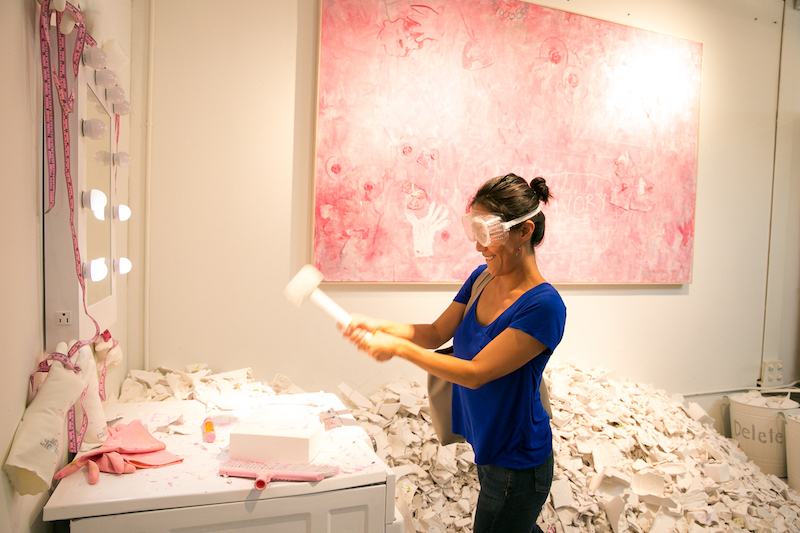 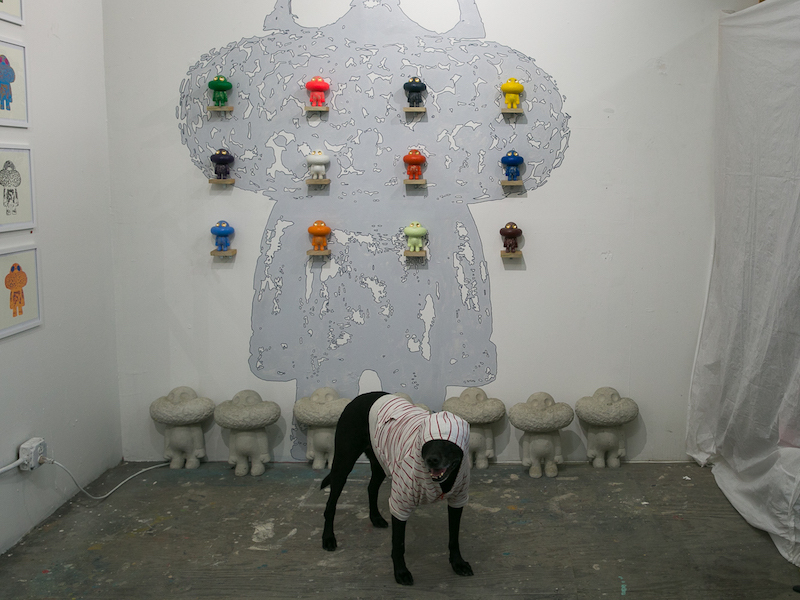 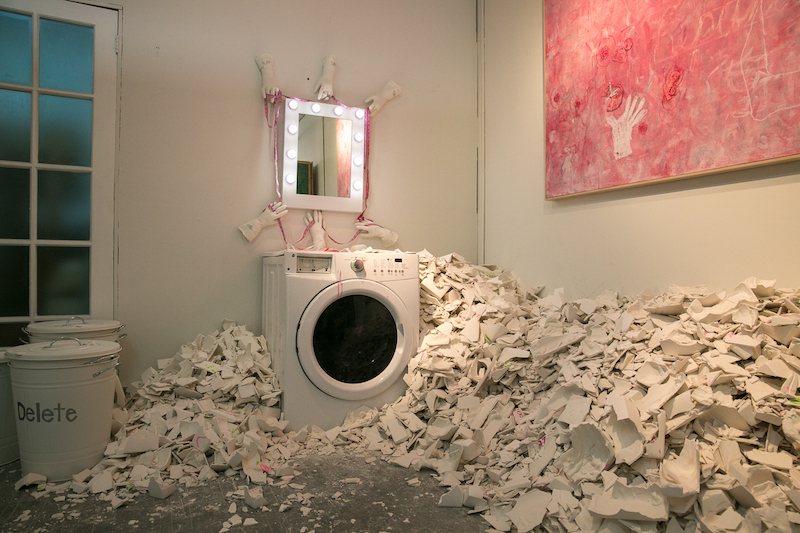 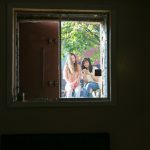 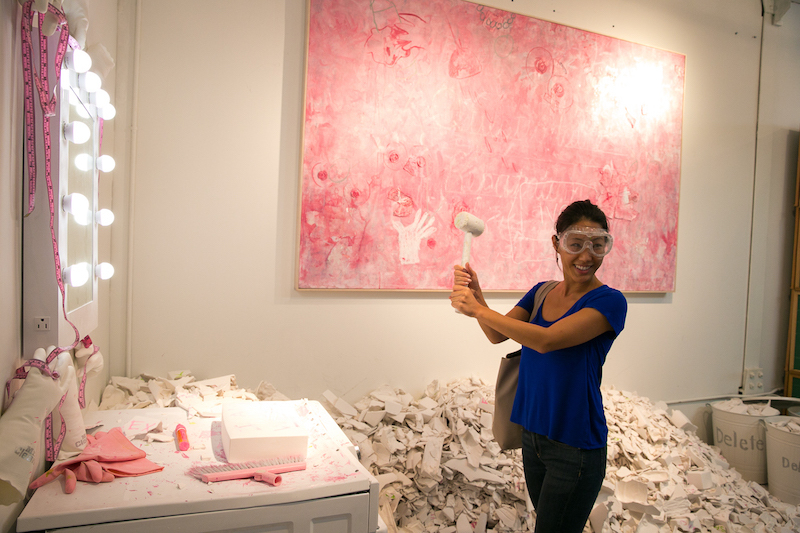 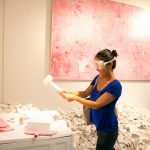 Rachel Lee Hovnanian's "The Women’s Trilogy" involved writing something on a plaster soap bar and then smashing it. 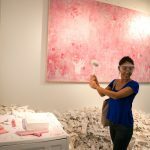 The artist spoke about getting caught up in social media and sometimes feeling inadequate because of it; she created this room to smash those notions. 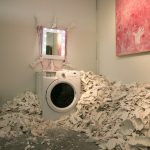 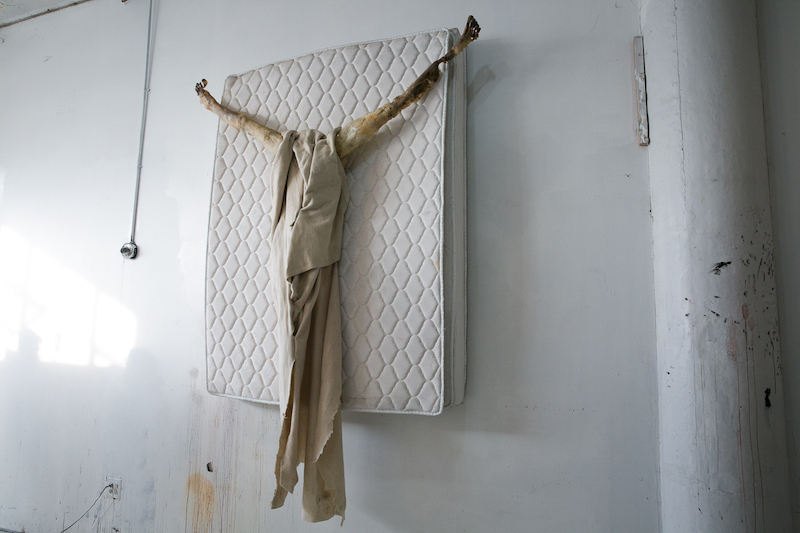 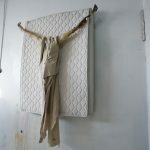 Rachel Lee Hovnanian's "The Women’s Trilogy." 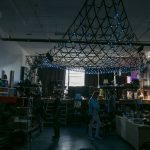 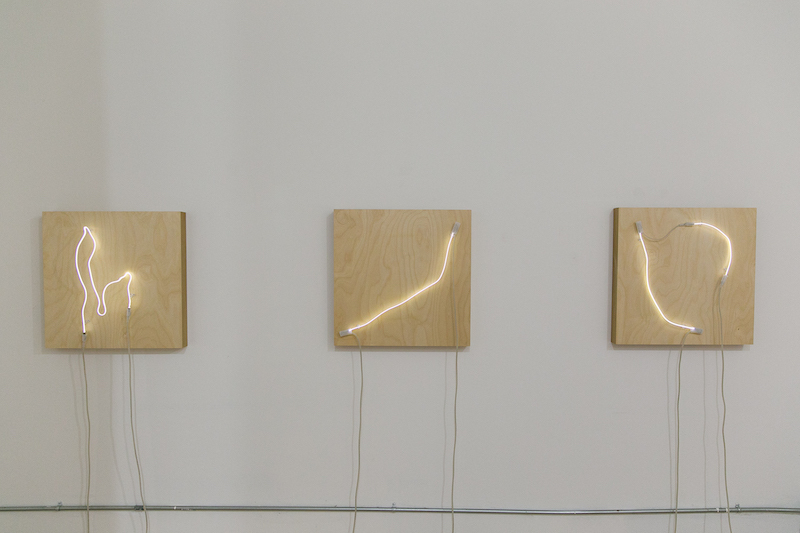 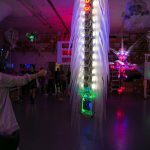 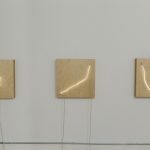 @dubpixel, @doctor_light and @chasev created robotic and light art that you could interact with, or press buttons to start, stop, or change the sound. 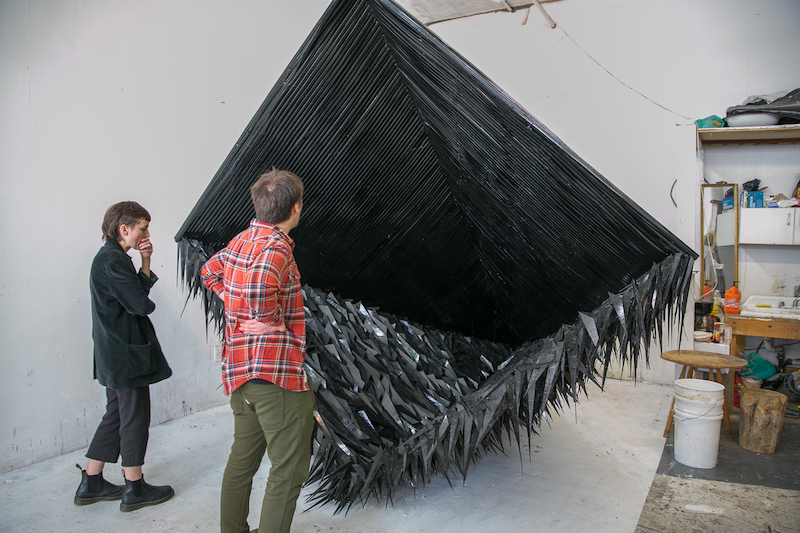 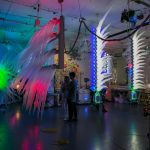 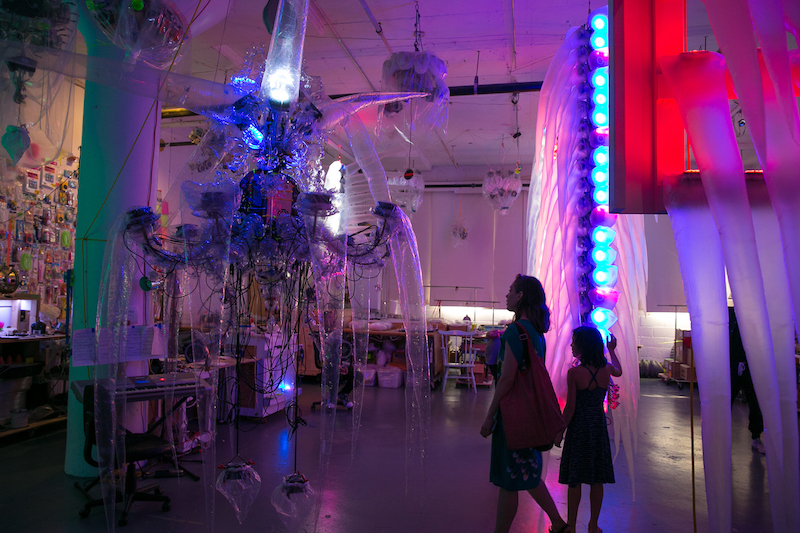 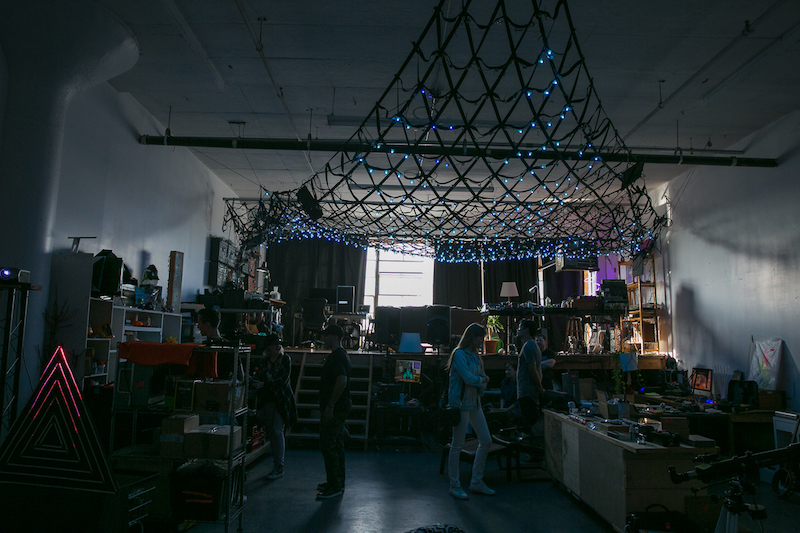 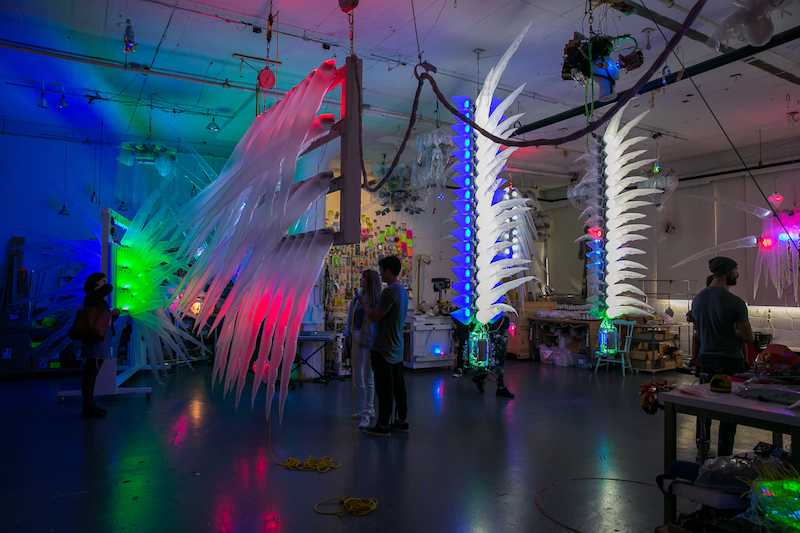 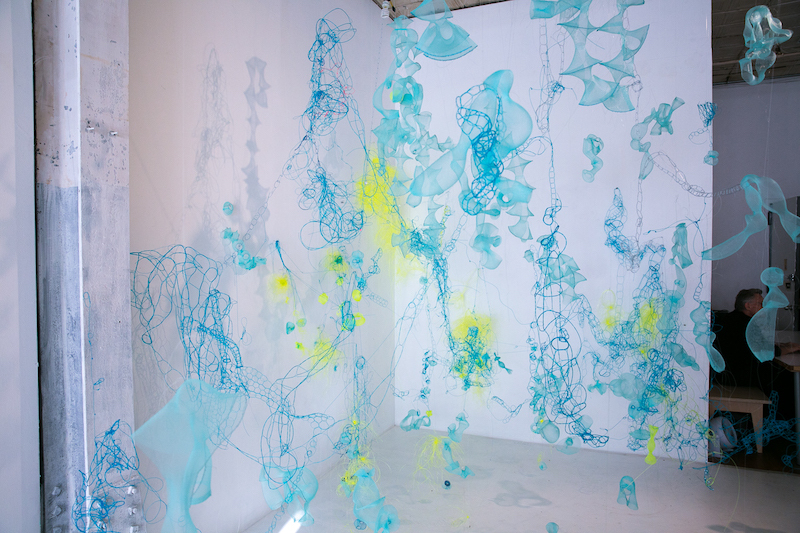 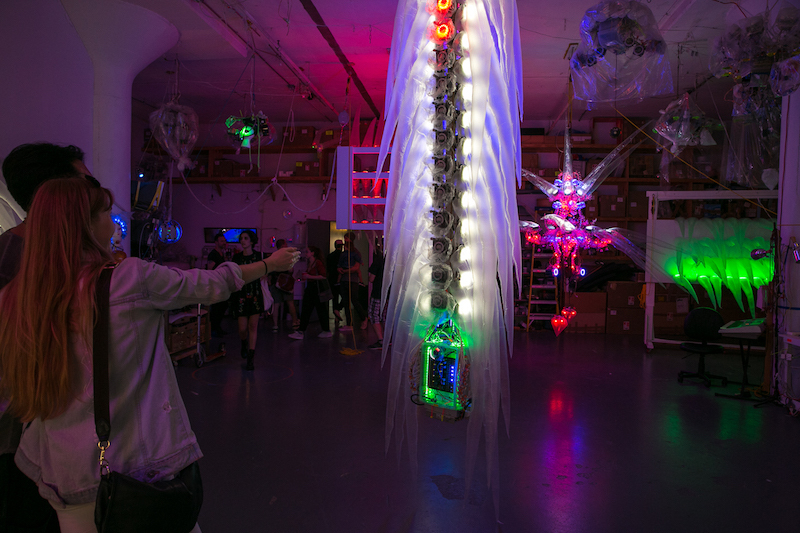 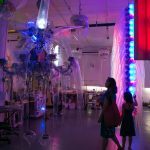 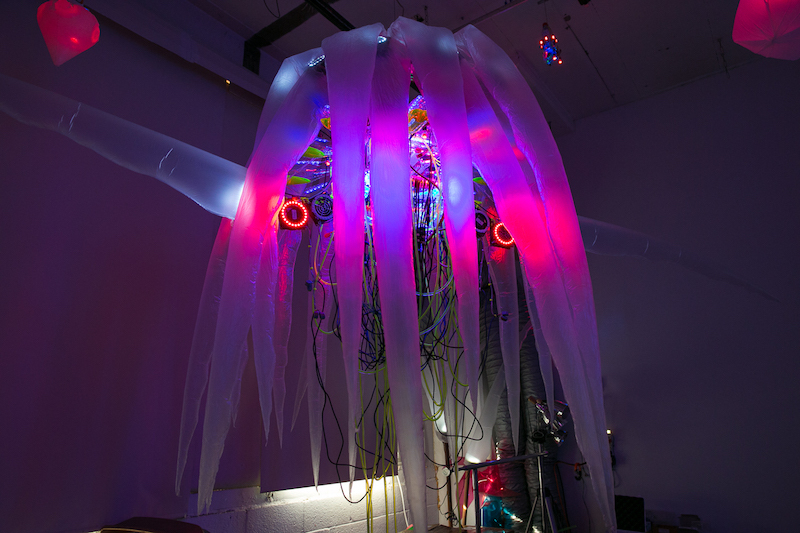 Shih Chieh Huang's "Reusable Universe." 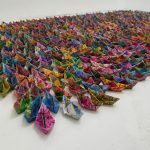 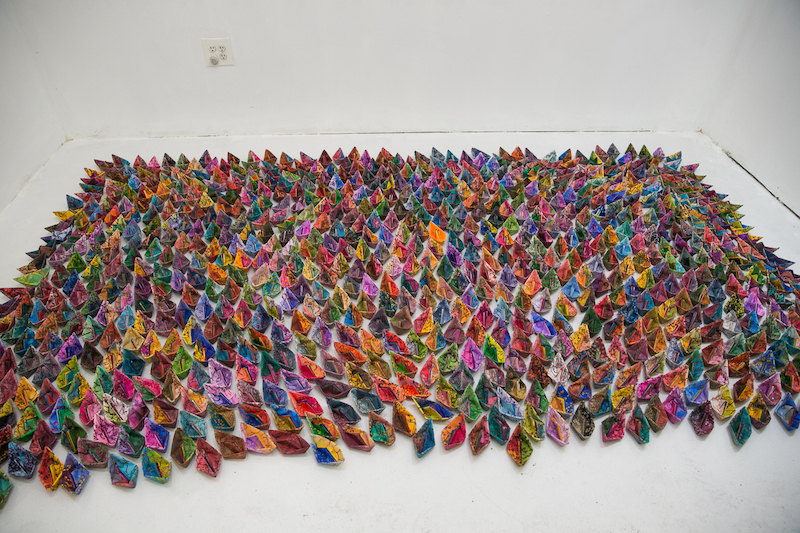 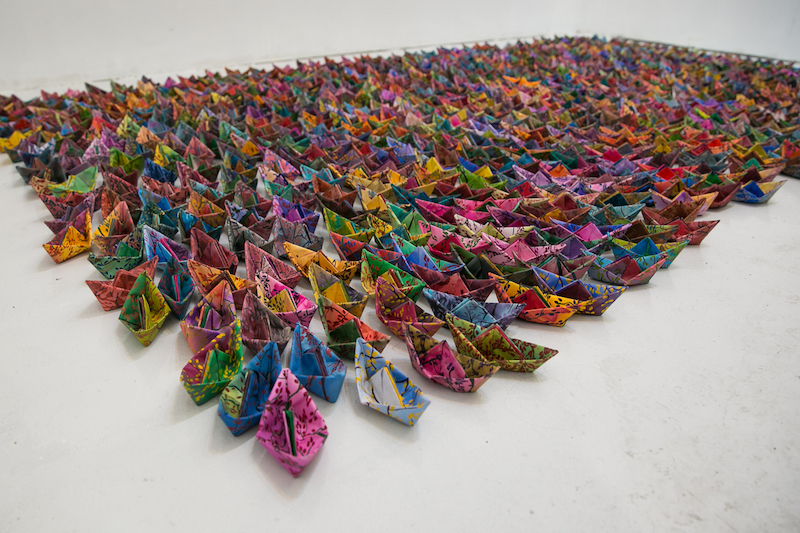 Mona Kamal made over 200 origami boats. 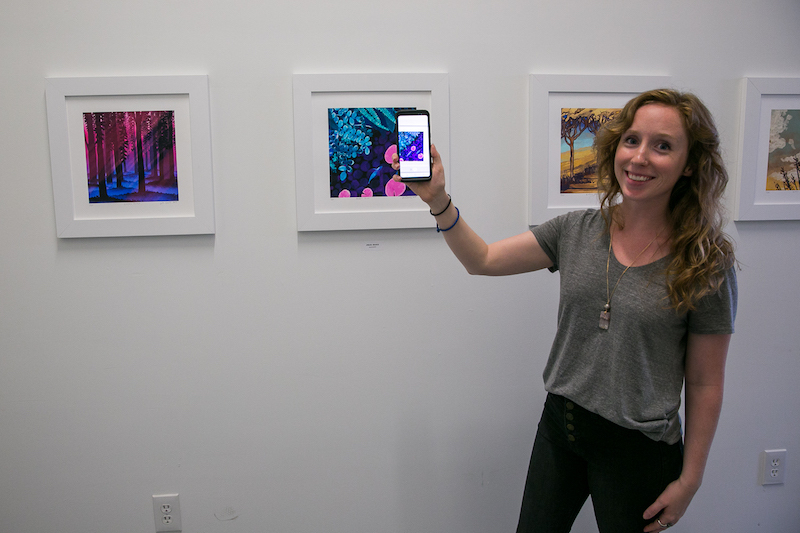 Animator Julie Gratz created augmented reality prints. 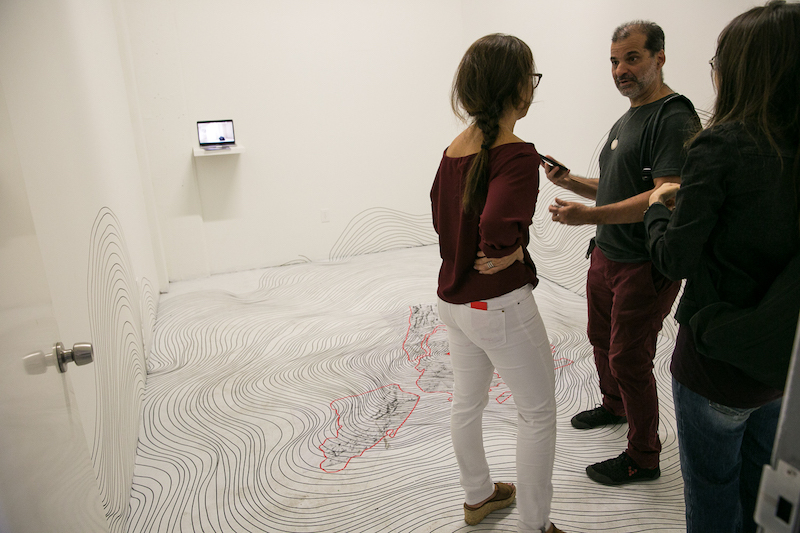 Holding an app in front of the image showed a full animation of the print with sound. 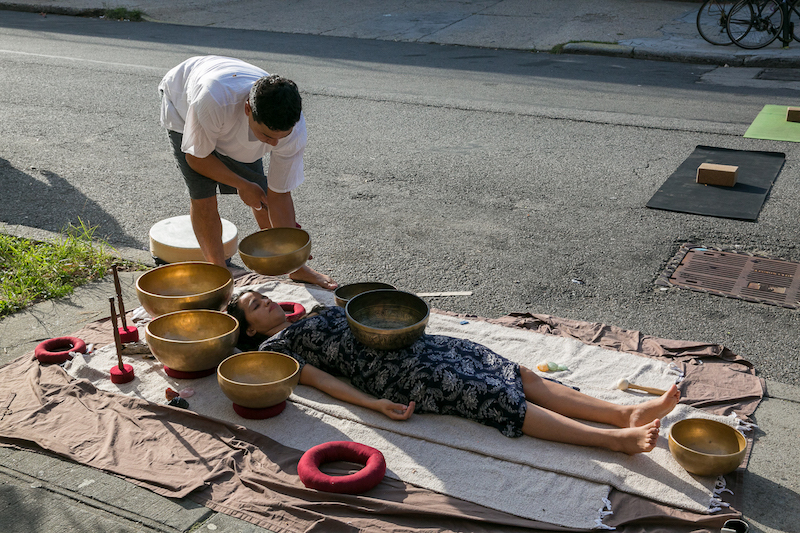 Sound bath outside of Absurd Conclave. 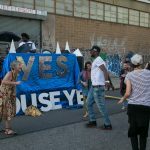 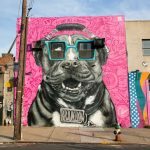 Jefferson Street art block party with House of Yes. 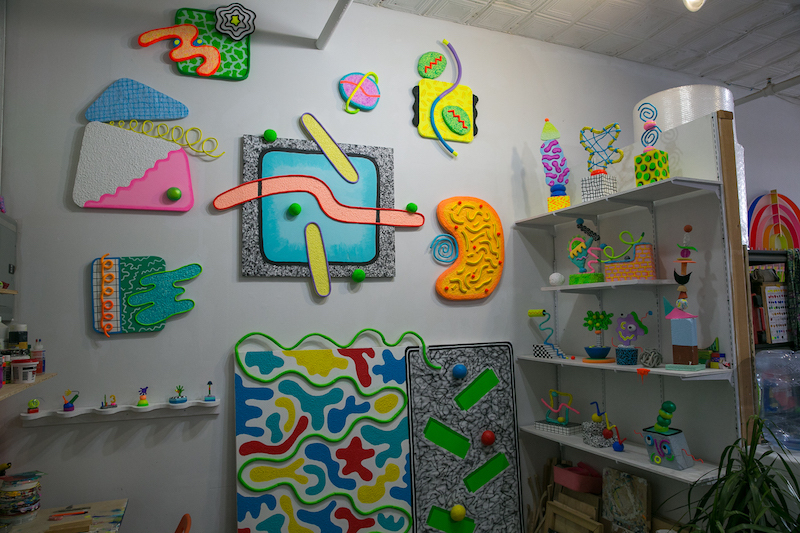 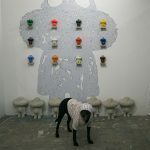 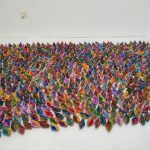 Kelly McCafferty's large pieces seemed like something out of the thick scrapbooks on a nearby table, except they were made with yarn pieces, beads, tiny toys, pins, etc. 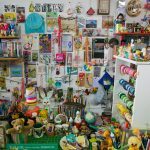 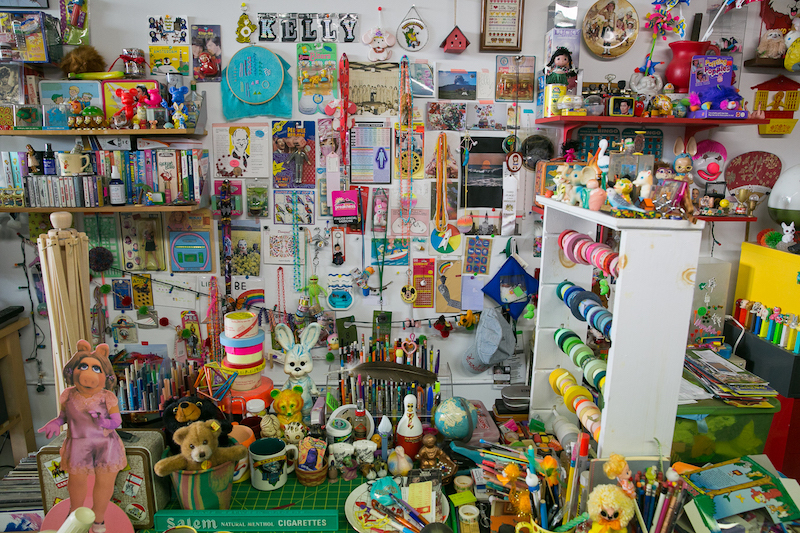 Her desk area, shown here, was more of a 3D version of her wall hangings. 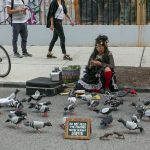 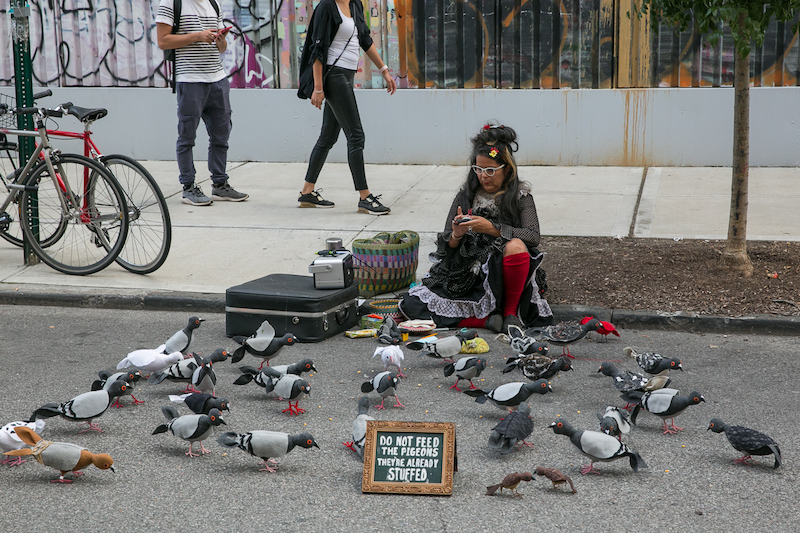 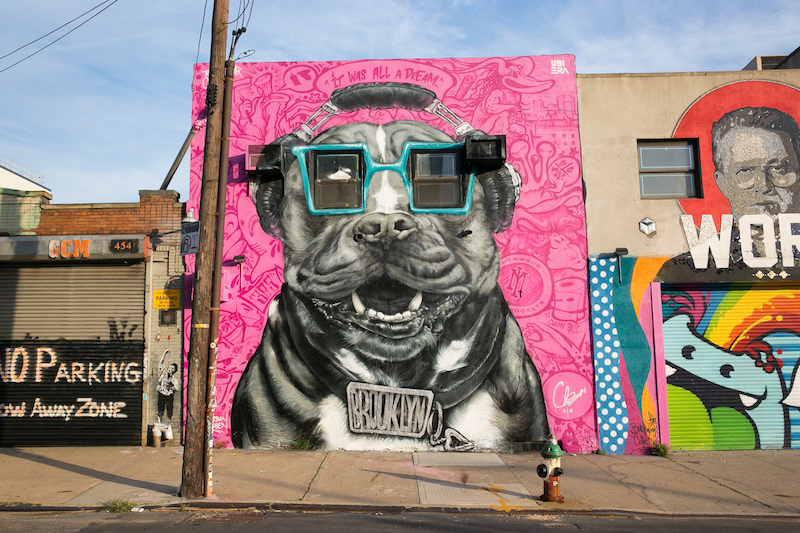 Artists knitted pigeons and cupcake crafts during an art block party on Grattan Street. 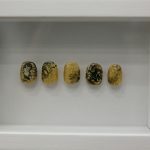 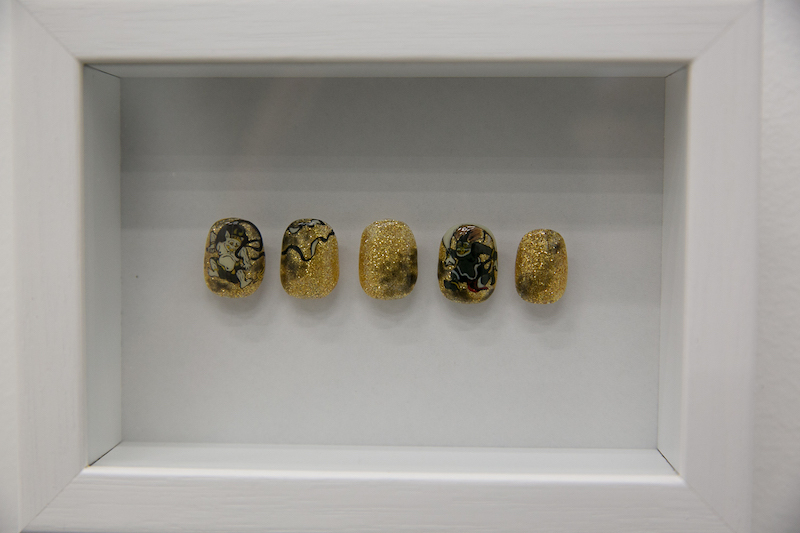 Yuki Okamoto's collection of nail art consisted of very intricate paintings on fake nails. 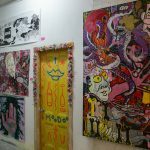 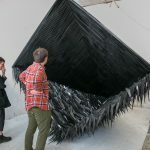 Radio Free Brooklyn host Dr. Lisa Levy (Miss Subways 2017) gave free advice on her therapist’s couch in front of a gallery. 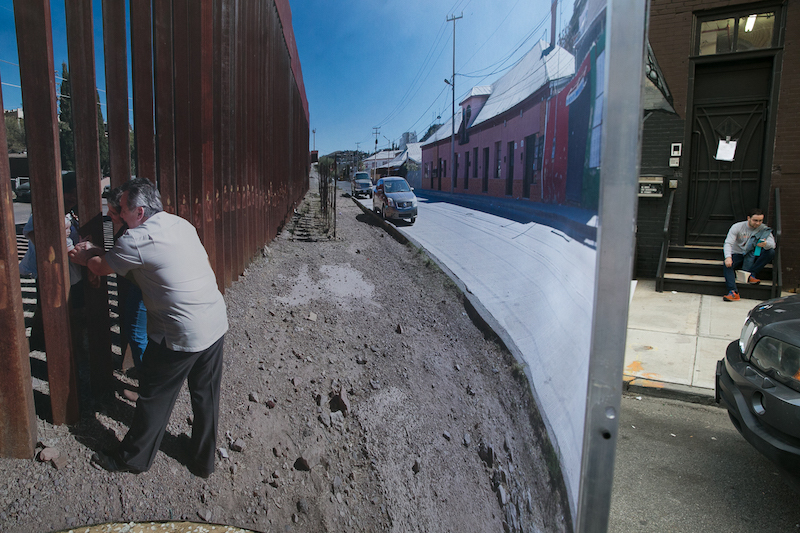 Phil Buehler's "Nogales," shot on the border of Arizona and Mexico, was a large photographic velodrome you could walk into. 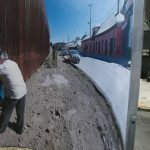 The life-sized panoramic image almost fully envelops you.